When Jenn Betz says, “My kids were older and I wanted to do something for myself,” what that meant was the purchase of the Deja Vu Diner, as a turnkey business in January, 2016. She could own it and her 20-something twin girls, Hannah and Hailey, could come to work in it. They talked about it at the beginning and agreed. Perfect. Enough time and experience to make a good go of it. 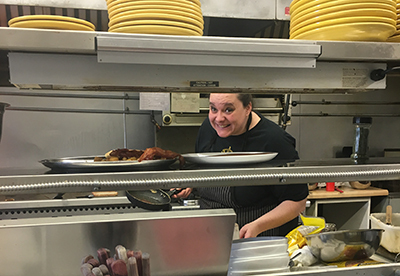 Ms. Betz was talking to us over a Deja Vu breakfast, the primary mission of the West Broadway diner: to serve good breakfasts and lunches from 7:30 a.m. to 2:00 p.m. during the week and opening at 7:00 a.m. on Saturday and Sunday. There is plenty of seating in the one large room, with a second room to one side. One is seated at a table with a simple formica top, what one would expect, no table cloths required. Still, coffee was served accompanied by a nice little bottle of milk, not wasteful tiny packages of milk and cream. We had ordered the poached eggs with a fruit cup, listed as such on the menu. It came as two poached eggs in a suitable bowl, along with another bowl of fruit that was real pieces of banana, watermelon and other melons, tasting pretty good for the time of year. Toast, coffee – reasonable prices. The menu is an interesting read, big on breakfasts, lots of variation on the theme, including breakfast poutine. Lunch is covered by favourite sandwiches, a chicken dish, hamburgers, with regular or dollar fires. And cream of potato and bacon soup. Indeed, she told us, “We recycle everything we can at home, so, we do here too. Even the Kcups and it takes some time to pull the guts out them. But we do it.” And she indicated her daughter Hannah working on clearing out a stack of them. Very much an Orangeville resident, Ms. Betz was born and raised here. “My uncle owned a restaurant here in town, a breakfast restaurant. When he sold it, everyone was bugging me to buy it but my kids were too small and I knew I couldn’t manage to own a restaurant and raise my kids. “My mom taught me how to cook and bake, growing up; since I could walk I was always inn the kitchen with her. When I was growing up, I just assumed everyone could cook. My mom was huge in the kitchen – she always cooked enough to feed an army. We never went without food, that’s for sure,” talking about her background and her childhood. Saturday mornings sees a magician come to the Deja Vu Diner. He goes around the tables and does tricks. The idea has brought in more people. She assured us that people like him because he’s funny and very clever. It’s special to have a magician come to the table and do tricks just for that small audience. Gives Saturday mornings a party atmosphere. In the second room, Ms. Betz sells (the best) butter tarts and Reunion coffee as coffee beans, plus lots of different coffees in K-cups. As to her ambition, she made the best comment a person can about their life: “I think I’m happy,” she said. All the information is on her updated website, dejavudiner.ca.